As a teacher, you are required to use your voice more than any other professional! Your voice is the most important tool that you have at your disposal to inspire students and help them learn effectively. Using your voice powerfully and effectively is the key to becoming an outstanding teacher. Developing a strong vocal presence in the classroom influences everything else that you do, helping to build your confidence and positive interactions with students. If you neglect your voice as a teacher, you are more likely to end up stressed, have a shorter teaching career and suffer from vocal health issues. the practicality of caring for one's voice. 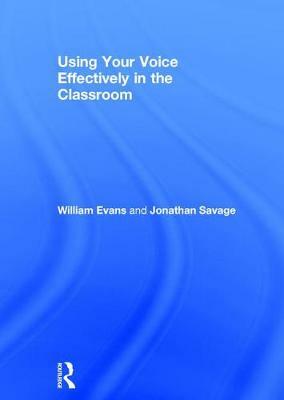 Using Your Voice Effectively in the Classroom offers a much-needed exploration and thorough examination of the voice in the classroom and will be an indispensable guide for trainee teachers, as well as valuable reading for all practising teachers. "This is an important and wide-ranging book that covers not only the use and protection of the voice, which is important for teachers as a topic in its own right, but also the ways in which teachers use their voices as key mechanisms for pedagogy. But in addition to this it also covers important areas relating to the different ways in which teachers actually find their own teaching voices, and what sorts of voice are appropriate on various occasions. These areas alone would make this book worthwhile, but what makes this book really stand out is that it also deals with the under-researched area of beginning teachers setting out to find their own voices. This is a fascinating and worthwhile subject area, and is so important in the early professional lives of all educators. This important book has something for all those who work with children and young people, and will make an important addition to the staff library of all schools and colleges."